The SS American Victory, the restored World War II merchant cargo vessel berthed in Tampa, sets sail on her ‘Salute to Service’ cruise on Saturday, March 23, 2019. Boarding begins at 11:00 AM with a departure around noon and return to dock by 4:00 PM. The ship is honored to be celebrating this cruise along with the 33rd American Merchant Marine Convention and Reunion. Special ceremonies during the cruise of Tampa Bay will recognize America’s veterans, law enforcement, and active duty military of all services. The ‘Salute to Service’ cruise is full of activities and entertainment for all generations. Aboard the ship, past and present military personnel, their families, local residents and visitors will enjoy live entertainment by Gloria West and the Gents, observe memorial services, experience weaponry demos, and explore the ship with an unforgettable voyage sailing Tampa Bay. To add to the experience, the ticket price includes a mouth-watering meal from MISSION BBQ. Beer, wine, and snacks will also be available for purchase throughout the duration of the cruise. Cruise tickets are $99 per person, $79 for veterans and first responders, and $59 for children 12 and under (ages 3 and under are free). Discounts are available for groups of 10+. Tickets can be purchased online or by visiting the ship. The ship departs from behind the Florida Aquarium, 705 Channelside Drive, Tampa. Parking is available in the Florida Aquarium Parking Lot, the Channelside Parking Garage, or other surrounding surface lots. “This annual fundraiser is incredibly important as our WWII heroes are leaving us every day. We’re proud to provide an exciting and impactful day on the water to celebrate their memories and the ongoing efforts of our servicemen and –women today”, remarks Bill Kuzmick, President of the American Victory Ship and Museum. Built in 1945, the SS American Victory voyaged around the world delivering crucial cargo during World War II, Korea and Vietnam. 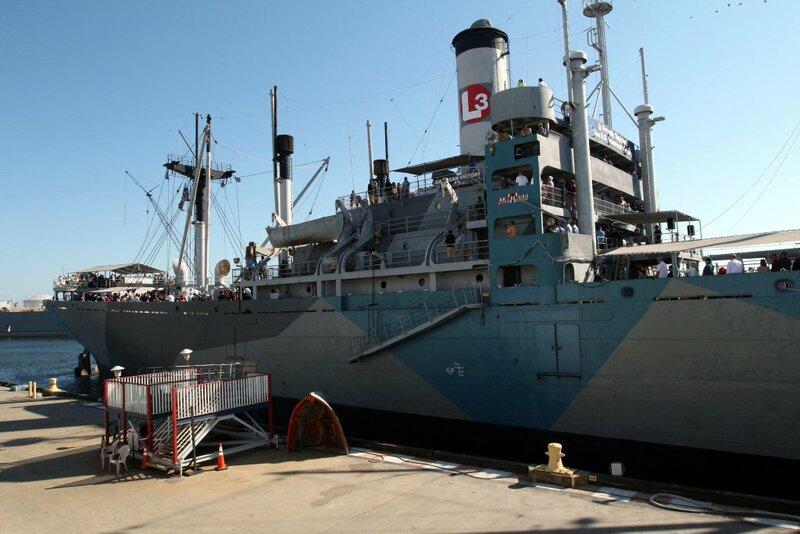 Today, the ship is one of only four operational World War II merchant steamships in the U.S. The SS American Victory provides daily educational tours, serves as a training site for firefighters, law enforcement officers, active and reserve military and working dogs, hosts special events, and benefits from memberships, donations and corporate sponsorships. Since the SS American Victory arrived in Tampa in 1999, dedicated volunteers have invested over 1,000,000 hours to restore, maintain and operate the vessel. The American Victory Ship and Museum receives no city, state, federal or tax dollar financial support. It relies heavily on private donations, grassroots efforts, and sincere dedication from its group of committed volunteers. This event serves as one of the ship’s major fundraisers for the year. The American Victory Ship and Museum is a nonprofit 501c3 organization and recognized in the National Register of Historic Places. The American Victory Ship and Museum is located in the Water Street District, directly behind The Florida Aquarium. For more information, please visit www.americanvictory.org.